Once you learn the skills and techniques of crocheting, it’s hard to put your hook down. Whether you love making crochet hats, crochet gloves, or easy and colorful crochet scarves, there are lots of fun projects for crochet fans of all skill levels in our new free eBook, 16 Free Crochet Hat Patterns, Scarves, & Gloves. Are you new to crochet? We have a special section just for you, filled with great beginner projects that you can make with ease. The projects in this eBook include colorful photographs, detailed instructions, and all the information you’ll need on how to crochet a scarf, hat, and much more. These free crochet hat patterns, scarf patterns, and glove patterns are perfect to make for yourself, but are even more fun when you make them for someone else! Once you learn how to crochet a hat using these free crochet hat patterns, the whole family will have matching headgear! We have beanies, cloches, brimmed caps and more, all waiting for you in our Free Crochet Hat Patterns eBook. For those who prefer a little more warmth around the neck, we have a crochet scarf pattern to suit anyone’s taste…from cowls, to bow ties, to fun and ruffly potato chip scarves. And when it comes to your hands, we’ve got a crochet mitten pattern that makes the perfect beginner project. All this and more is waiting for you in our new eBook, 16 Free Crochet Hat Patterns, Scarves, & Gloves! Download your copy of 16 Free Crochet Hat Patterns, Scarves, & Gloves today. Show off your crochet skills by making a crocheted hat for all your loved ones! These free crochet hat patterns are great for men and women, and there’s a hat for every skill level! There’s no denying that hats have made a comeback in recent years, none more so than these fun and funky crochet beanies. This Grey Slouchie Beanie is just what every woman needs for winter. Make this fun and easy crochet hat in any color you’d like…or make several so you have one to match your favorite outfits! And when you download your free copy of 16 Free Crochet Hat Patterns, Scarves, & Gloves, you’ll find this and more free crochet hat patterns, just waiting to be made. The best thing about these crochet hat patterns is that they can be worn anytime, not just in the cold months. Hats make great accessories and can be worn any time of year. Mix and match colors to create multicolored hats for you and your friends. Crocheted hats are also great beginner projects. From following these free crochet hat patterns, you’ll learn about crocheting in the round, switching colors, increasing and decreasing stitches, and much more. If you’re skilled in making crocheted flowers, you could also add a sweet floral embellishment to the side of your crocheted hats. Who says you need to buy new clothes to update your wardrobe? Just add one of the fun and free crocheted hats from our free Crochet Hat Patterns eBook and you’re ready to go! When you’re first learning to crochet, scarf patterns are the way to go. They are easy and quick to make and are great projects to help you learn the skills and movements of crochet. Plus it’s impossible to have too many scarves! That’s why we’ve started off 16 Free Crochet Hat Patterns, Scarves, & Gloves with a great selection of fun scarves, like this Double the Fun Potato Chip Scarf. 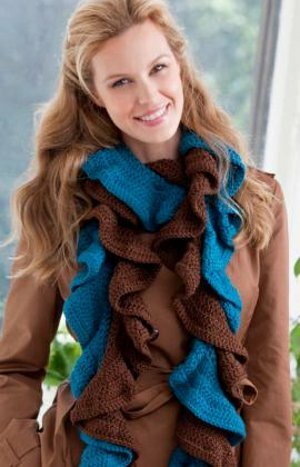 Made with two colors, this crochet scarf pattern is as fun to make as it is to wear! You can mix and match colors to help compliment any outfit and this fun fashion piece is great for wearing in the colder months or just to add some texture to your wardrobe. Don’t be surprised if people start requesting that you make them one, too! And thankfully you’ll have our Free Crochet Hat Patterns eBook readily available so you can show them all the fun things you can make! If you find two shades of yarn that you really like, you can use a crochet glove pattern from our eBook to create gloves that match your ruffle scarf. How cute would that be? Have you ever wondered how to crochet fingerless gloves? What about how to crochet mittens? Well wonder no more! We tell you just how to make them in our free eBook, 16 Free Crochet Hat Patterns, Scarves, & Gloves. This Lacy Wrist Warmers pattern is easy to follow and these fun crochet fingerless gloves work up quickly. Having these wrist warmers on hand in the office is a great idea, since it keeps your hands warm but your fingers free for typing, texting, and writing. You’ll find this fingerless gloves crochet pattern and many more in our Fee Crochet Hat Patterns eBook. If you want to keep your fingers warm, we also have a great crochet mitten pattern that even the newest of crochet fans can make. So warm up those fingers and get to downloading your free copy of 16 Free Crochet Hat Patterns, Scarves, & Gloves! Sometimes you just love a pattern so much that you have to have matching accessories for your accessories! That’s why we were sure to include a section for matching crochet hats and scarves in our free eBook, 16 Free Crochet Hat Patterns, Scarves & Gloves. In this section, you’ll receive instructions on how to make cute crocheted hats that have matching crochet scarf patterns, like this La Poetique Scarf and Beret Set, for example. This hat and scarf set is stylish and cozy, and it’s just the thing to add a pop of color to your outfit. Matching sets like this make wonderful gifts for the holiday season, as well as gifts for birthdays and Mother’s Day. If you want to add matching crochet mittens, go right ahead! You can easily create your own matching sets with your free copy of 16 Free Crochet Hat Patterns, Scarves & Gloves. Those who are new to crochet should not shy away from getting their own free copy of 16 Free Crochet Hat Patterns, Scarves & Gloves. We have lots of great crochet hat, scarf, and glove projects for beginners that will help teach you all you need to know to make the more advanced patterns. It’s like you’re getting a full crochet course for free! This Beginner Crochet Cap is perfect for new hookers. Make this easy crochet hat for you or a friend and you’ll find that you’ll be hooked on crochet in no time! There’s also great crochet scarf patterns for new crocheters, as well as a beginner crochet mitten pattern. We even included a hat and scarf set in our Free Crochet Hat Patterns eBook that you can make with ease. All of these crochet hats, crochet scarf patterns, and crochet mittens can be yours, absolutely free. All you have to do is click to download the eBook, and you can save it to your computer, print it out, or just bookmark the page and return as often as you like! 16 Free Crochet Hat Patterns, Scarves, & Gloves eBook a great way to learn the basic skills of crochet, or to help you fall in love with crocheting all over again! From crochet hats to crochet fingerless gloves, this eBook is filled with fun crochet accessories that you can wear year round…so get ready to get hooked on crochet! The Crimson Ridge cowl in a beautiful deep berry red color, is unique for the fact that it has a slight shaping- narrowing in toward the top. This little tweak is just what it needs to really sit nicely around the neck. All it requires is a skein of Wool Ease Chunky! 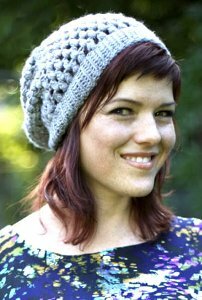 The Vickie Howell designs slouchy puff stitch beanie is such a versatile design. It makes use of the Caron Soft yarn which has a great sheen to it and will create a superb drape on that slouch! The puff stitch is a crazy fun stitch to do. It is appropriately described in the pattern, so that even if you've never done it before you'll be able to tackle it. I love crochet. Thank you for this free e-book. wonderful time for me. greetings from Kuta Bali, Indonesia. Hi there, Thanks so much for making us aware of this site. We will take all necessary action to ensure that this eBook remains free for ALL. Have a great day! Hi there, br br According to Crochet for Dummies, "Front post stitches are raised crochet stitches on the surface of the fabric facing you." Hope this helps! What does (RS) mean in crochet directions? i would assume it means Right Side, as in the outer surface of the garment. Looks great! Can't wait to make one of the hats and wristlets. Thank you for the patterns! I want to thank you for the E-Book Patterns for beginners, each one looks so great. Lidia M.